Oct. 1 — An explosion violently shook a Lawrence, Mass., home off its concrete foundation on the evening on Sep. 13. The blast destroyed the structure, badly injured the people inside and killed 18-year-old Leonel Rondon of Lawrence when bricks landed on his car just outside the demolished home. Simultaneously, one mile away, the upper floor of an apartment building burst into flames, destroying multiple homes and exposing residents to harmful smoke and burns. 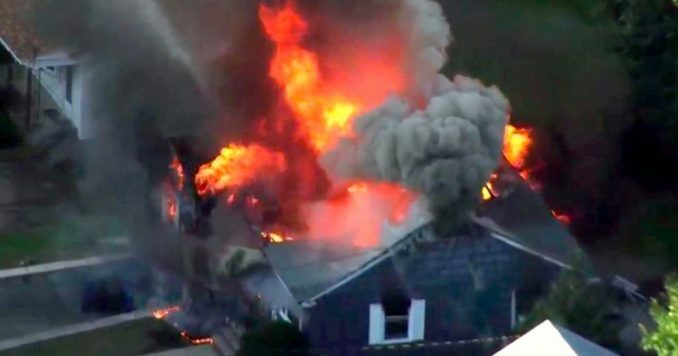 Seconds later, another explosion rocked a building in North Andover, one town over. Then another a few miles to the south. Then yet another. The cascade of fire and destruction stemmed from natural gas lines operated by Columbia Gas of Massachusetts. Hundreds of disaster responders battled 10-alarm blazes and dozens of smaller fires and explosions. Local officials ordered an evacuation, and the power utility, National Grid in Massachusetts, which is unaffiliated with Columbia Gas, cut power to 18,000 homes and structures, fearing any spark might ignite more leaked gas. Overnight at shelters, people congregated to find emergency food and beds, charge their phones and share information about who was counted safe, who was missing and who might be injured. By dawn on Sept. 14, an estimated 85 fires, gas leaks and explosions were reported. About two dozen people were admitted to hospitals for injuries. Thousands of now-homeless Merrimack Valley residents were told they could not return home until their address was listed as safe on their city or town’s website. Initially, authorities reported that this would take only hours or days. However, now after two weeks, it seems more likely that the process of inspecting homes may take several more weeks to complete. Once home, residents must contact their utility company to request restored service, which for many will mean no heat until well into the coldest months. Many area residents reported the unmistakable odor of mercaptan, a natural gas additive, in the air during the disaster. Earlier in the morning of Sept. 13, Columbia Gas had issued a service notice announcing repairs and “upgrades.” This included overdue gas pipe replacements at nine locations in the same communities hit by gas leaks and explosions later that day. Though an investigation has yet to report precise findings about the cause of the explosions, community groups, organized utility workers, environmental and Indigenous rights activists and other experts alike voiced outrage that this problem was likely rooted in preventable overpressurization of many miles of outdated gas lines owned and maintained by Columbia Gas. This was confirmed when the federal agency handling the investigation announced its inquiry will focus on overpressurized gas lines, pressure sensors and pipe inspections protocols. Among community members angry about the preventable disaster are more than 1,100 Greater Boston Area gas utility workers in United Steelworkers Locals 12003 and 12012, who have been locked out by National Grid in Massachusetts since late June. National Grid PLC, headquartered in London, is a transnational utility company, among the 300 largest publicly traded companies in the world, and the largest gas utility in Massachusetts. Rather than dedicate its vast resources to improve safety, the company wields its record profits to further investment in pipelines and fracked gas and to push an agenda of union busting that reverberates across the industry to smaller companies like Columbia Gas. During the National Grid lockout, now entering its fourth month, company managers, supervisors and scab contractors hired by National Grid — dubbed “National Greed” by the labor movement — are conducting repairs at an unsafe, unprecedented breakneck pace, while trained union workers hold pickets and other actions to draw support to end the lockout. Over the summer, locked-out USW teams monitored work sites where strikebreakers were assigned to repair work under dangerous conditions. Video footage shared on social media calls public attention to incidents in which workers are seen in gas line trenches as powerful excavator machine shovels dig perilously close around them. In another captured video, chemical runoff is seen contaminating a coastal area, the direct result of failure of a repair crew to set a haybale barrier around their gas repairs in a heavy storm. At least one company supplying strikebreaking labor to National Grid during this lockout has been linked to the Merrimack Valley catastrophe. It provided contract labor to a Columbia Gas service site leading up to the Sept. 13 gas disaster. Organized utility workers want these unsafe contractors removed and union workers restored to the job, where they can provide a positive solution to this crisis. But utility companies and their venture capitalist investors are more than willing to disregard safety in order to generate profit. They would rather hire more costly strikebreakers and pay out lawsuit settlements than prevent a disaster and the suffering it brings to communities. Many supporters of the “end the lockout” campaign recognize the just fight of Local 12003 and 12012 against National Grid bosses for fair pay and benefits and the right to maintain and improve safety on the job and for the public. USW Local 8751, the Boston Bus Drivers Union, issued a Sept. 15 statement connecting the offer made by locked-out workers to the Merrimack Valley community’s demands for justice and accountability: “Honor USW’s offer to provide disaster relief in the Merrimack Valley, now,” the statement read. “Corporate utility CEOs and their scab non-union contractors responsible for blowing up Lawrence and Andover should be arrested and jailed for negligent homicide, mass destruction of property, endangerment of communities, price-gouging, profiteering, and illegal unfair labor practices,” the Local 8751 statement concluded.